Digital Collections - Lake Forest College | An interurban roadway in 1950. 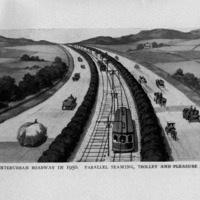 Parallel teaming, trolley and pleasure ways. An interurban roadway in 1950. Parallel teaming, trolley and pleasure ways. Chicago Plan Commission, Commercial Club of Chicago, “An interurban roadway in 1950. Parallel teaming, trolley and pleasure ways.,” Digital Collections - Lake Forest College, accessed April 26, 2019, http://collections.lakeforest.edu/items/show/2098.